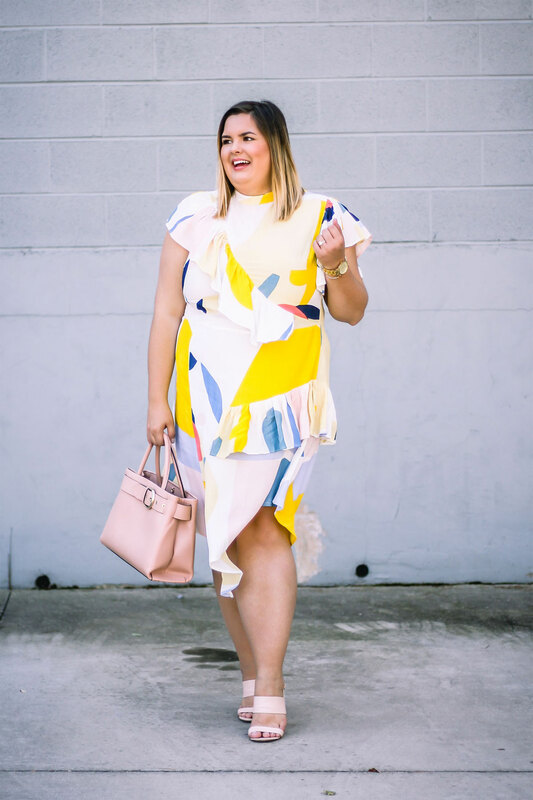 North Carolina-based Sarah Slusher (24) works in social media for a cosmetics company, and documents her outfits over at Stylish Sassy & Classy. She loves a good Summer dress (and has quite the collection), embraces colour year round, and enjoys wearing white bottoms. 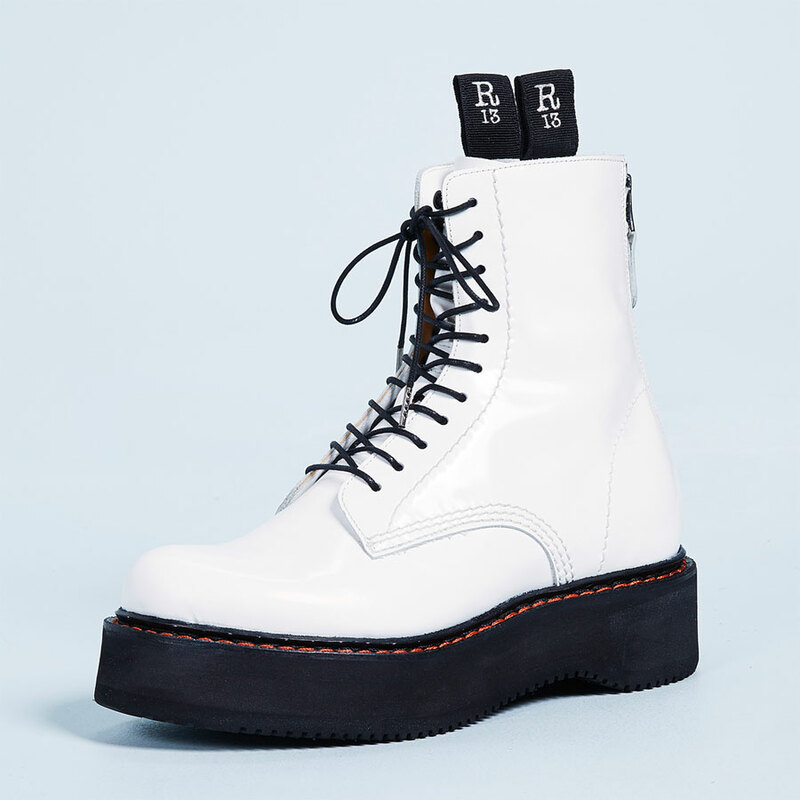 Our blogger also likes interesting footwear and is somewhat of a bag aficionado. Summer tops in this warm shade of pink can be hard to find, and the colour works so well with Sarah’s skintone. She’s paired the ruffle-sleeved, high-low hemline top with white skinny jeans for a polished casual look. The black floral embroidered mules are on-trend, and a clever touch because they pick up the colour of the top and our blogger’s small crossbody bag. 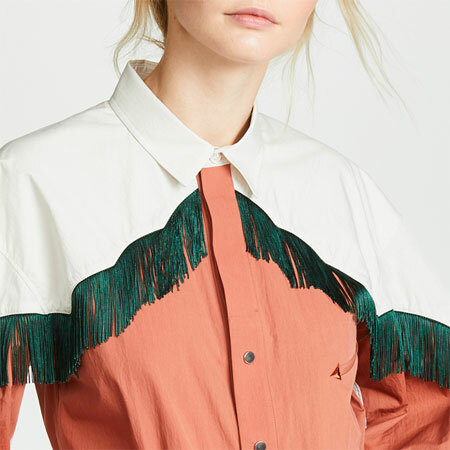 Together with the ruffled sleeves they also add textural and visual interest. Soft pink lipstick and gold bracelets are all that’s needed to finish off the look. The pattern on this frilly asymmetrical dress looks like an abstract work of art. 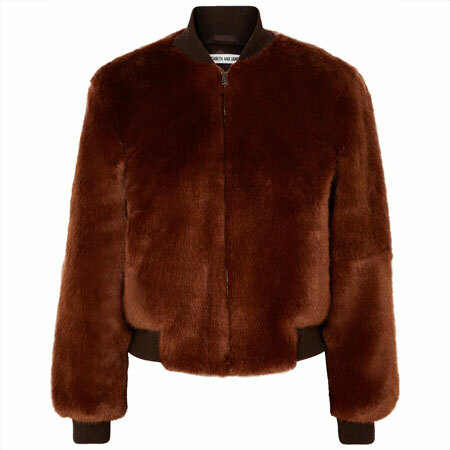 The high neckline and subtle waist definition provide structure. While the magical diagonal lines created by the ruffle detailing add movement to the look. Sarah is a fan of sporting pastels year round, and is wearing block heel sandals in a blush that matches the blush in her dress. She added a structured tote in a slightly darker shade of blush that complements the other pink tones. Apricot lippy, a gold watch and ring complete this colourful dressy outfit. Yellow was one of Sarah’s favourite colours this Summer, and this crochet lace top in mustard is a stunner for sure. The off-the-shoulder style adds an alluring touch, while emphasizing our blogger’s shoulder line and providing light arm coverage. Pairing the top with dark-wash skinnies and ankle-strap espadrilles gives the outfit a boho-lite vibe. At the same time, the ornate lace detailing dresses up the look. Rolling the jeans showcases the shoe. Sarah’s black shoulder bag comes out to play again and echoes the colour of the sandals. A gold bracelet and two dainty gold chain necklaces are the accessories of choice. A sweater dress is an easy throw-on-and-go option for Fall and Winter. This fab grey number hits Sarah just below the knee, fab that midis are reigning supreme. The vertical rib knit creates a long, lean line. The subtle flutter sleeves add the slightest touch of drama. Our blogger’s black suede booties with chunky block heel and the quilted bag provide textural interest. The white bag also picks up the white in her lightweight plaid scarf, which is the perfect accessory for the cooler days that are coming. 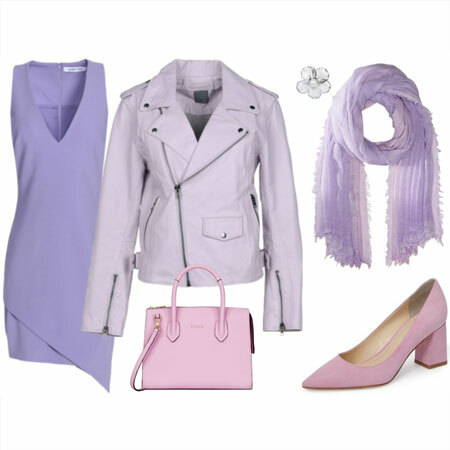 Sarah’s love of white bottoms and pastels come together in this casual chic Winter look. Light grey and white makes an elegant colour combo year round, but I find it especially eye-catching in Winter. 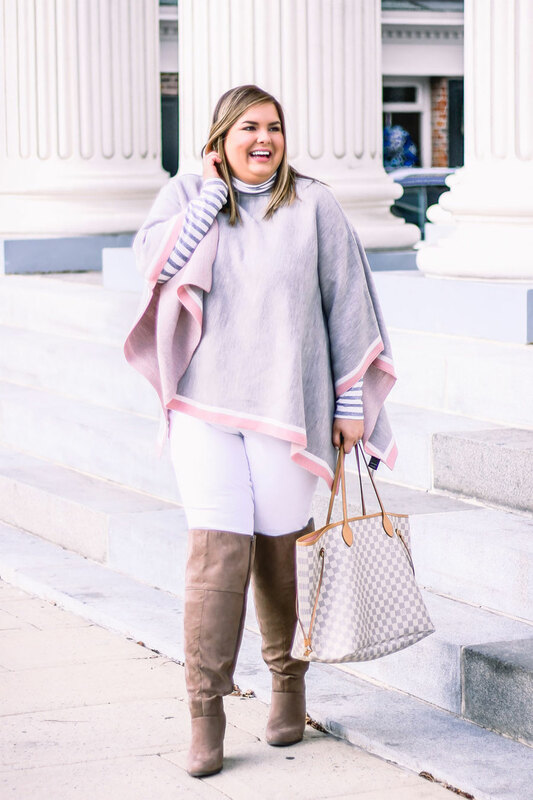 Our blogger is wearing white skinny jeans and light grey poncho with fun pink and white tipping. The white and grey striped tee peeking out from under the poncho adds a preppy playful touch. Tucking the jeans into faux-suede over-the-knee boots gives the look an equestrian vibe. Sarah’s white and grey checked bag with cognac trim works beautifully with the colour palette. Sarah’s pink lipstick and happy smile finish things off to perfection. 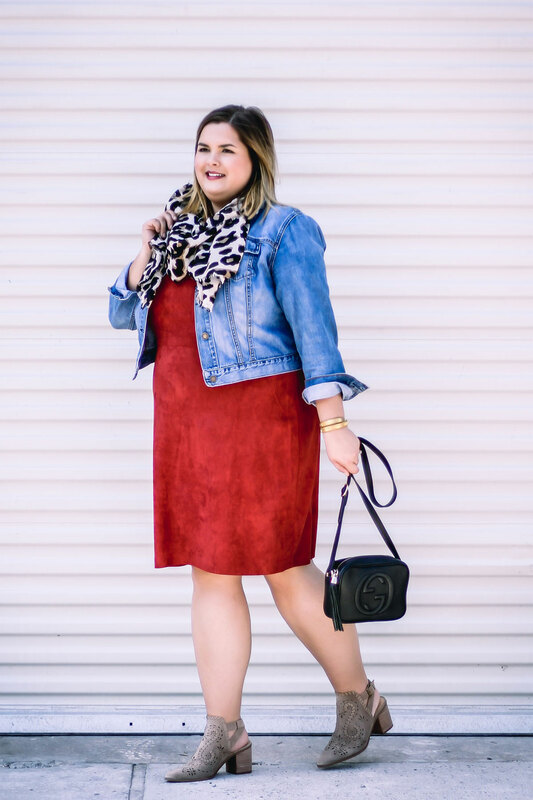 Our blogger’s faux-suede dress in a striking shade of red is undoubtedly the star of the show. The texture-rich frock with subtle waist definition is a great length on 5’6” Sarah. She dresses it down with a cheeky cropped denim jacket that creates great proportions. Combining the outfit with a leopard print scarf in cool-toned colours is an unexpected touch, and provides extra oomph. Adding grey ankle booties with whipstitch details and swirl perforations is a nice nod to the Wild West trend we are seeing everywhere for Fall 2018, and adds soft edge to the outfit. Sarah finishes off the look with gold bracelets, her trusted black bag, and a darker lipstick that complements the dress. What do you think of Sarah’s elegant, polished style and use of colour? Let us know in the comments, and then head on over to her blog to browse the rest of her wonderful outfits. Thanks for the introduction to Sarah. Her polished looks are captivating; the colors and silhouettes beckon. The asymmetrical dress stopped me in my tracks: stunning! An all time favorite here. Off to see her blog. Wow, she has a great style, especially love her last look, head to toe texture, detail/accessory and color rich, so fabulous! i love that Sarah switches it up between brights and pastels, and that she wears a variety of silhouettes….clearly Sarah is willing to try new things and experiment….i was going to say my fav was the denim and yellow blouse outfit, until i got to the red dress! love that color on Sarah, and the way she has played with dressy and casual, FAB! Love her style, especially the colours, as well as the accompanying analysis of the outfits! Lots of things to learn here. My faves are the red dress and The swirly pastel dress. The color combo of the red dress outfit is just inspired- would love to copycat that! Love Sarah’s styling – her look is beautifully yet naturally put together. And she tops it all off with a gorgeous smile! 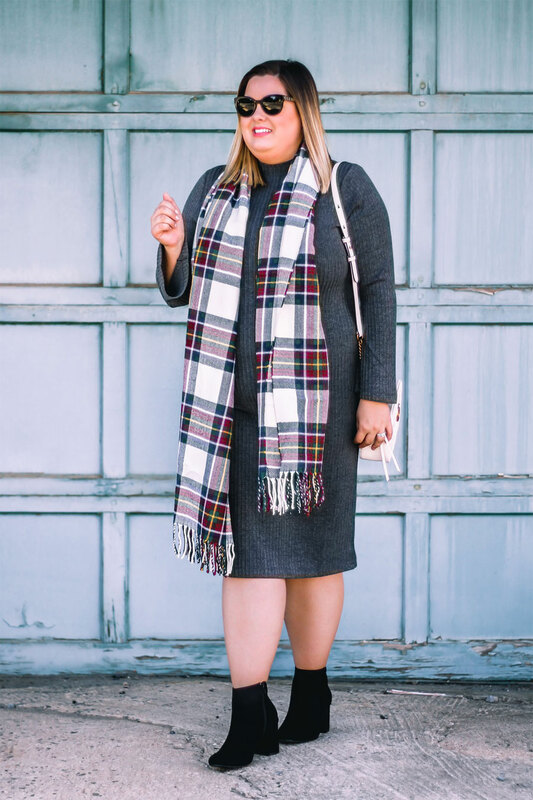 The sweater dress and plaid scarf ensemble is cozy and chic! Great looks, very inspirational. I love that mustard lace top with jeans, such a great mix of dressy and casual. Lovely inspirational but attainable looks. Wow Sarah is gorgeous and whilst I am much older than her, I would love to wear each and every one of her outfits. I am particularly taken with her white jeans and over the knee boots and poncho outfit, such a great use of colour and proportions. Sarah is super-cute! I love her attention to detail in her outfits and the variety of styles and colours. I am really drawn to the frilly asymmetrical dress, yellow top and jeans and the last outfit the best, but she looks lovely in everything! Off to check out the rest of her blog. What a stunning smile! Gorgeous from top to toe, and KILLER fabulous outfits. I’m going with the citron dress and white jeans with poncho as my favourite looks. What I love most about Sarah’s style is her immaculate sense of polish. It never gets old. Fresh, crisp and chic. Rock on! Oh yes! Forgot to mention how much I like the colour-richness of Sarah’s style. LOVELY. The asymmetrical dress is outstanding. How she found it, I’ll never know. She’s got great style! 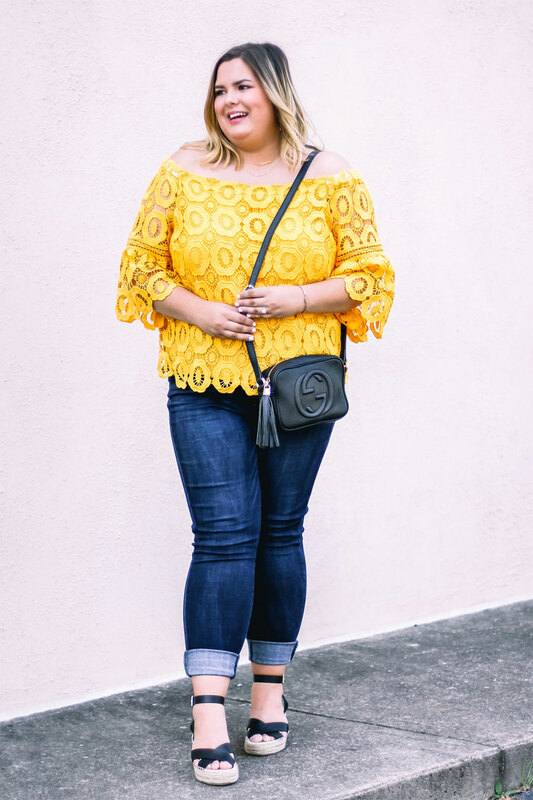 I’m swooning over that lace mustard top! Fabulous outfits! I love that asymmetrical dress on her. It’s stunning! I’d wear almost all of these outfits. They are very polished & easily adaptable. Eliza & Suz – The dress is just so amazing, isn’t it!! kkards – Sarah is definitely an inspiration when it comes to use of colour. Jussie – Glad you feel that you could wear these outfits too. merwoman & D. Louise – Exactly, Sarah’s fab smile is the icing on the cake. Bijou – Fun that you’re feeling inspired. BlueJay – *nodding* Sarah really has a keen eye for detail and colour! Lyn, Sigrid, Robin, Cardiff girl, Lesley – Thank you very much for chiming in. Absolutely love her looks, but that asymmetrical dress with blush complements is my fav! She looks so polished and put together. I never looked that good at her age. I could see myself in almost all of these outfits. Every look is fab. I especially love the poncho — so cozy. I sure do like the abstract dress with yellow coupled with blush accessories. 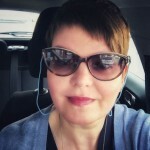 Sarah has a great sense of mixing colors and pieces – thanks for the introduction Inge! Thanks Inge as always for pointing out all the details! My favorites are the asymmetric dress and blush accessories and poncho outfit. mtnsofthemoon & Runcarla – It’s a stunning look for sure! Shevia – She does indeed. suntiger- Happy to hear it’s helpful! 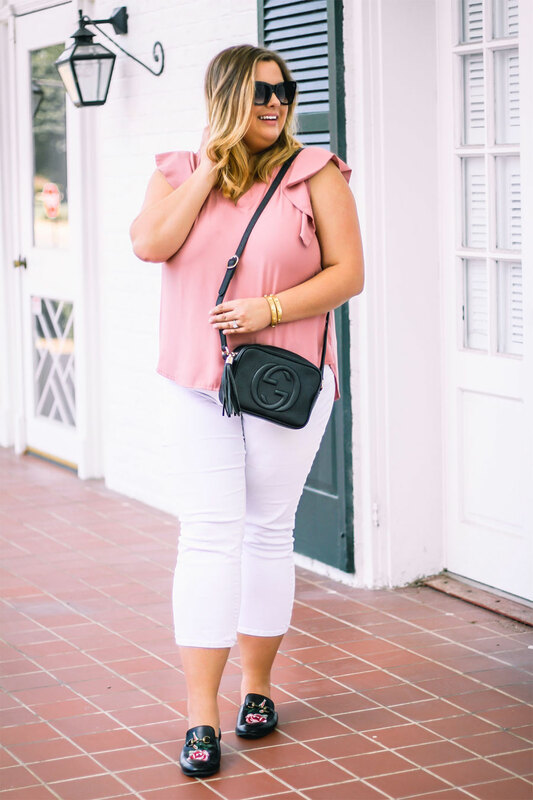 I love that she is closer to my shape and size than most of the outfit bloggers featured here and elsewhere. Yay for more visibility for those of us who are neither slender nor hourglass-shaped! I’m old enough to be her mother and yet I could imagine both my teen daughter or me wearing every one of those outfits with only minor changes. Now that’s ageless style! I have a red dress in a similar shade and a cropped denim jacket, so I’m planning my own version of that last outfit. The sweater dress did it for me and I agree with her that a great smile lights up any outfit! Absolutely love how she smiles! 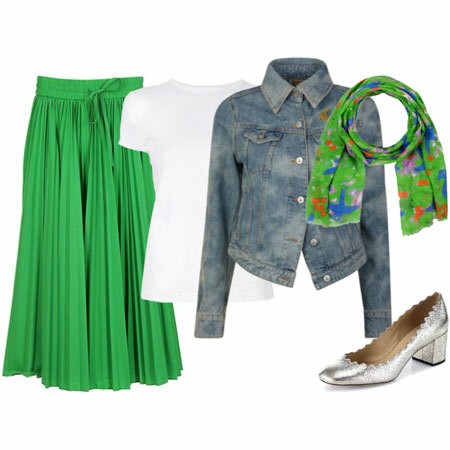 Chrizzle – So fun that you are going to recreate Sarah’s last outfit! oris01 – Totally agree about her smile too!